I have a 5-year-old who loves playing in water. Whether it’s a pool, water park or splash pad, he loves to get wet. So, periodically throughout the winter and even more so now that summer has arrived, he’s remained pretty persistent in asking when the local outdoor pools will open. Well, with Memorial Day weekend upon us, I can finally inform him and all of you about the opportunities to get wet, cool off and have fun in Hendricks County this summer. So, here’s a look at the top 3 options with a few tips sprinkled in. The most popular and well known spot is Splash Island Family Waterpark in Plainfield, Indiana. Last year, I wrote about their new expansion, which included an amazing 900-foot Leisure River that I’ve personally tried and absolutely loved. They have single and double tubes, which are perfect for an individual or in my case, me and my son to float along the winding river. You can read more about the entire expansion by clicking here. I also previously unveiled insider tips to make the most of your day at Splash Island, such as arriving early to beat the crowds and the free sunscreen wipes that are provided by IU Health West. If you are planning a trip to Splash Island, I would highly recommend you read all 10 by clicking here. 2013 Splash Island Opening & Hours: Open from 10 a.m.-6 p.m. May 25; noon-6 p.m. May 26; and 10 a.m.-6 p.m. May 27. Beginning June 1, the park is open every day through Aug. 6 from 10 a.m.-6 p.m. Monday-Saturday and noon-6 p.m. on Sundays. After Aug. 6, the park is only open on weekends, closing for good Labor Day weekend. 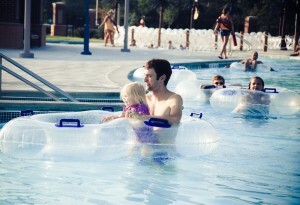 Wet Wednesdays: From 7-10 p.m. every Wednesday, June 1 through Labor Day the park reopens for Wet Wednesdays. For more information and pricing, click here. But Splash Island isn’t the only game in town. In fact, on a warm day our other two options usually have far less crowds. Many of the locals will probably be mad I even shared these options with our visitors. The first has many of the same amenities as Splash Island just on a smaller scale. 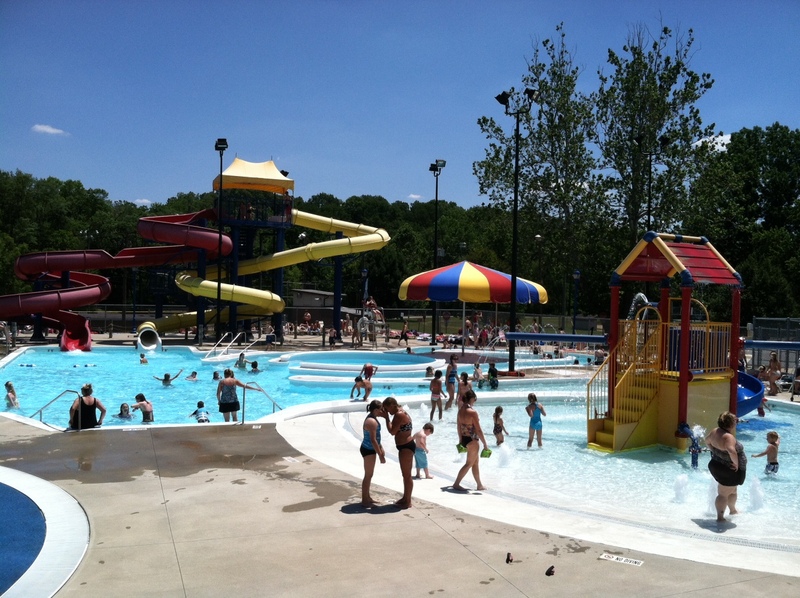 The Gill Family Aquatic Center, on the back side of Ellis Park in Danville, provides nearly as much fun despite its smaller size at a more affordable price. The park has two water slides, a splash pad and a zero-depth entry pool with a small slide for young children. It also has a diving board and a pool with lap lanes for swimming. As is the case with Splash Island, Gill Family Aquatic Center also has concessions, so you don’t have to leave the facility to eat. 2013 Gill Family Aquatic Center Opening & Hours: Opens May 25. Hours are 11 a.m.-7 p.m. Monday-Saturday and noon-7 p.m. Sunday. For more information and pricing, click here. My last recommendation while not on the scale of either water park is just as fun for my 5-year-old. The Washington Township Park Splash Pad is the only free option of the bunch, and really is hidden away in the lower level of the park, 115 S. County Road 575 East in Avon. The best tip I can give you is to try to show up early if you want a spot on any of the benches around the Splash Pad or bring your own chairs. There are shaded picnic tables on each side of an adjacent shelter, but those areas can be rented out for parties. There also aren&apos;t many shaded areas nearby, other than in the shelter areas, so you may want to slather on the sunscreen even if you aren&apos;t planning on getting wet. Also, as an added bonus, if your kiddos get tired of the water, an adjacent playground provides an entirely different fun experience. 2013 Washington Township Park Splash Pad: Opens May 25. Hours are noon-7 p.m. every day Memorial Day weekend through Labor Day weekend. For more information, click here. Knowing my 5-year-old, there is a good chance I will be at all three this summer. I hope to see you there.